BPA testing in canned food. We contracted with a national analytical laboratory to test 97 cans of food we purchased in March 2006 in three major, chain supermarkets in Atlanta, Georgia; Oakland, California; and Clinton, Connecticut. The lab tested 30 brands of food altogether, 27 national brands and 3 store brands. Among the foods we tested are 20 of the 40 canned foods most commonly consumed by women of childbearing age (NHANES, 2002), including soda, canned tuna, peaches, pineapples, green beans, corn, and tomato and chicken noodle soups. We also tested canned infant formula. The lab detected BPA in fifty-seven percent of all cans. BPA is associated with a number of health problems and diseases that are on the rise in the U.S. population, including breast and prostate cancer and infertility. Given widespread human exposure to BPA and hundreds of studies showing its adverse effects, the FDA and EPA must act quickly to set safe levels for BPA exposure based on the latest science on the low-dose toxicity of the chemical. Widespread exposures, no safety standards. In studies conducted over the past 20 years, scientists have detected BPA in breast milk, serum, saliva, urine, amniotic fluid, and cord blood from at least 2,200 people in Europe, North America, and Asia (CERHR 2006). Researchers at the Centers for Disease Control and Prevention recently detected BPA in 95% of nearly 400 U.S. adults (Calafat et al. 2005). EWG-led biomonitoring studies have detected BPA in people from four states and the District of Columbia (EWG 2007). BPA ranks in the top two percent of high production volume chemicals in the U.S., with annual production exceeding a billion pounds (TSCA 2006), and is so common in products and industrial waste that it pollutes not only people but also rivers, estuaries, sediment, house dust, and even air nearly everywhere it is tested. Government assessments fail to consider BPA low-dose toxicity. As of December 2004, 94 of 115 peer-reviewed studies had confirmed BPA's toxicity at low levels of exposure. At some of the very lowest doses the chemical causes permanent alterations of breast and prostate cells that precede cancer, insulin resistance (a hallmark trait of Type II diabetes), and chromosomal damage linked to recurrent miscarriage and a wide range of birth defects including Down's syndrome (vom Saal and Hughes 2005). Few chemicals have been found to consistently display such a diverse range of harm at such low doses. 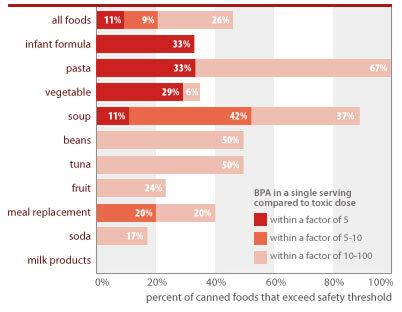 The U.S. EPA established its generic safety standard for BPA (the reference dose, or RfD) in 1987, a decade before the BPA low-dose literature was established (EPA 1987). The vast majority of studies finding BPA toxic at low doses have been published since 1997, the year that a pivotal study showed BPA's ability to harm the prostate at levels far below what was thought safe (vom Saal et al. 1997). EPA's safety standard is 25 times the dose now known to cause birth defects in lab studies (50 ug/kg/d vs. 2 ug/kg/d), and has not been updated for 20 years. The U.S. National Toxicology Program's 2001 assessment, which found BPA safe at low doses, relied heavily on industry-sponsored studies showing no low-dose BPA effects (NTP 2001). These studies are now known to have used animals resistant to the effects of estrogen-like chemicals such as BPA (vom Saal and Hughes 2005). The NTP assessment considered studies published in 2000 or earlier. The six years following this review have seen the publication of dozens of low-dose BPA studies that substantially bolster the now near irrefutable evidence for low-dose effects. FDA published estimates of infant and adult BPA exposures 10 years ago. Even though the Agency did not then and has not since assessed the low-dose toxicity of BPA, in 2005 an FDA official asserted, in response to questions from a California legislator considering a state BPA phase-out bill, that "...FDA sees no reason to change [its] long-held position that current [BPA] uses with food are safe" (FDA 2005). FDA makes this assertion even though the Agency has not yet established an Acceptable Daily Intake (ADI) for BPA, and has not even conducted the Agency's standard, basic toxicology study to determine a safe dose for humans (FDA 2007). BPA's low dose toxicity. Companies began using BPA in metal can linings in the 1950s and 1960s (Schaefer and Simat 2004), fully twenty years after the chemical was first understood to be toxic (Dodds and Lawson, 1936 and 1938). These early warnings of toxicity were ignored or forgotten while companies steadily increased their reliance on BPA until it reached an annual U.S. production exceeding one billion pounds around 1990. In 1993 the chemical's signature toxic property, its ability to mimic estrogen, was accidentally discovered in a failed lab experiment (Krishnan et al. 1993), and the intervening years have witnessed the development of a body of low-dose science that has transformed our understanding of chemical toxicity. Timing of the dose. While traditional methods set safety standards to control risks defined in adulthood, bisphenol A studies reveal that exposures at other times can confer far higher risks, especially in the womb and during early childhood. For example, recent studies show that prenatal exposure to BPA causes breast cancer in adult rats (Murray et al. 2006), and causes genetic changes resulting in greater risk of prostate cancer in later life. (Ho et al. 2006). In another study adult rats which had been dosed in the womb developed breast cancer in adulthood (Munoz-de-Toro 2005); these exposure levels during adulthood would not have caused cancer. Genetic susceptibility. Traditional toxicology holds that a chemical's potency and risks are constant, regardless of who is exposed. Bisphenol A suggests a different truth: A person's genetics plays an important role in defining risks and health outcomes from exposures to toxic chemicals. For instance, studies suggest that for some but not all babies, BPA accumulates in amniotic fluid, suggesting differing innate capacities for excretion that would be defined by genetics (Yamada et al. 2002). A recent study of mammary gland development showed that animals exposed to BPA in utero are more likely to develop mammary tumors when they are exposed to carcinogenic chemicals later in life, compared to animals not previously exposed to BPA (Durando et al. 2007). This study is one of many suggesting that early-life exposures to BPA may alter the expression or strength of genes to dramatically alter disease risk later in life. A study showing that BPA exposures lead to an error in cell division called aneuploidy that causes spontaneous miscarriages, cancer, and birth defects in people, including Down Syndrome (Hunt et al. 2003). A study linking low doses of BPA to insulin resistance, a risk factor for Type II diabetes (Alonso-Magdalena et al. 2006). The unusually broad toxicity of BPA is explained by a prominent scientist as stemming from the fact that BPA can alter the behavior of over 200 genes — more than one percent of all human genes (Myers 2006). These genes control the growth and repair of nearly every organ and tissue in the body. Taken in its totality, the range of toxic effects linked to BPA is startlingly similar to the litany of human health problems on the rise or common across the population, including breast and prostate cancer, diabetes, obesity, infertility, and polycystic ovarian syndrome (Myers 2007). Dr. George Pauli, at the time FDA's associate director for science and policy, offered this rationale: "FDA sees no reason at this time to ban or otherwise restrict the uses now in practice" (Pauli 2005). Never mind that the Agency's estimated exposures for infants, at 15-24 ug/kg/d, exceed by a factor of up to 10 the dose shown to permanently alter prostate gland growth. Bisphenol A is just one of hundreds of chemicals that pollute people - proof of critical need to reform our system of public health protections. Studies by European scientists show that BPA is just one of many chemicals that leach out of food can linings. Tests of just three can coatings found at least 23 different BPA-related chemicals leaching into food, all without legal limits (Schaefer and Simat 2004). Research shows these contaminants occur at levels that can dwarf better-known environmental pollutants that accumulate in food, like PCBs and DDT. One scientist writes that "Concentrations of [migrant chemicals like BPA] commonly exceed...pesticides by orders of magnitude; most of the migrating compounds are not even identified; and only a few have been tested for toxicity..." (Grob et al. 1999).